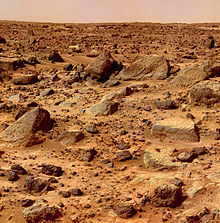 Geological evidence gathered by unmanned missions suggest that Mars once had much liquid water on its surface. In 2005, radar data revealed the presence of large quantities of water ice at the poles, and at mid-latitudes. 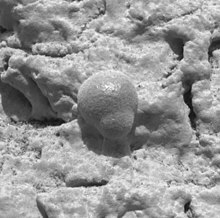 The Mars rover Spirit sampled chemical compounds containing water molecules in March 2007. 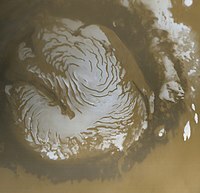 The Phoenix lander found water ice in shallow Martian soil in July 2008.Landforms seen on Mars strongly suggest that liquid water at some time existed on the planet's surface. Huge areas of ground have been scraped and eroded.